Captain O-Ring is a manufacturer and worldwide supplier of o-rings, offering standard and custom size/color o-rings & rubber parts, custom plastic parts, and o-ring kits. Captain O-Ring is proud to offer a variety of different packaging types for our custom o-ring kits that best fit our customers’ unique needs. We can provide a variety of different packaging types including zip-tops bags, rigid clear plastic compartment boxes, and limitless other options to meet customer specs. ​​Our zip-top bags are available in all sizes to fit our client’s needs and are normally based off the size/quantities of the parts within the bag. We have all common sizes stocked for quick turnaround.Our zip-top bags are available in normal 2mil thickness or heavy duty 4mil thickness and are the best and most common packaging type for inexpensive spare parts kits. Assortment of parts packaged into kraft paper envelope with thermal label. 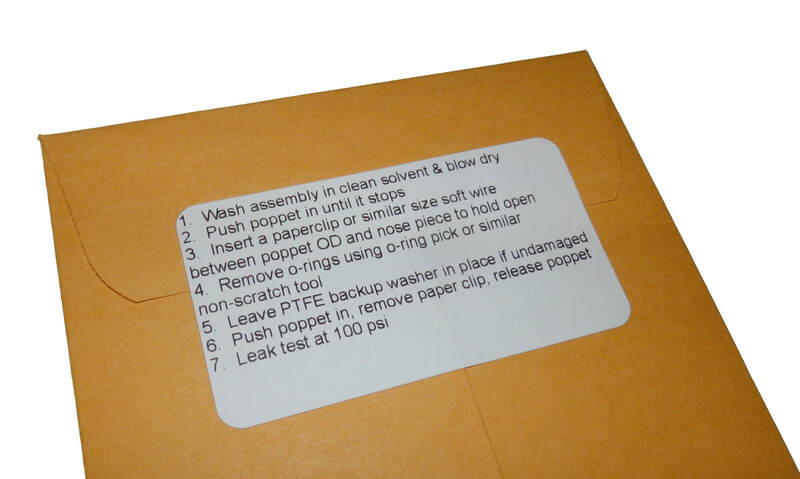 Kraft paper envelope sealed with thermal instructions label. Assortment of color coded o-rings that can be packaged in any of our packaging options.